This August shots were heard again on the Indian-Pakistan border. This alarming news was brought from South Asia by news agencies. According to the Indian military officers, five Indian soldiers were killed by Pakistanis earlier this month during a patrol in the Poonch sector on the Line of Control in Kashmir. It is also reported that a Pakistani civilian was recently killed in the same region. On August 20, the Armies of India and Pakistan exchanged shots of heavy artillery in the north of Srinagar – the summer capital of Indian Cashmere. These incidents occurred against the background of the ongoing negotiations between the parties on the termination of military conflicts and the attempts to resolve the conflict, which has lasted for nearly 60 years. We should recall that the confrontation between the two sides, which is decades long, still has not found a peaceful solution. Constant clashes on Indian-Pakistan border have caused some devastating wars between the two countries. According to international observers, the Indian side welcomed the appointment of Nawaz Sharif as the head of the Pakistani government. This politician has several times led the government of his country. It was during his stay in power when serious steps to normalize Pakistani-Indian relations were taken. According to some sources, since the beginning of 2013, there were more than 30 confrontations at the line of control in Kashmir, which could have grown into full-scale military conflicts. According to the estimates of the Indian side, the cease-fire agreement in Kashmir has been violated by Pakistan 57 times. This, according to their estimates, is 80% higher than the number of such clashes that occurred in the previous year. It is difficult to talk about further improvement of bilateral relations, given the border conflicts during the period under consideration. Moreover, as it became known from Indian sources, on August 3 of this year, Pakistani agents made an attempt to blow up the consulate general of India in Afghanistan. The explosion was organized by the terrorist organization Lashkar-e-Tayyiba – LET, based in Pakistan. The Indians say that the number of penetrations of this and other terrorist groups to the territory of Kashmir, patrolled by India, has significantly increased this year. Observers share this opinion that the Pakistani military establishment is deliberately exacerbating the Indo-Pakistani conflict to show the new government of this country “who is the boss”. It is assumed that the Pakistani army, thus, wants to warn the government of N. Sharif not to go “too far” in trying to improve bilateral relations, as had been the case during the period when N. Sharif was at the helm of the country. Our readers do not need to be reminded how much effort Russia and the entire world community made “to bring to peaceful terms” these countries. Let us not forget that both countries have nuclear weapons and are not bound by any international obligations not to use them. It is also known that some rich Arab countries are trying to “persuade” the Pakistani leadership “to share the secrets of their manufacturing” in order to ensure the balance of forces in the region. Shortly before the current border incidents, N. Sharif, after his return to active political life as the head of the government, displayed genuine interest in improving bilateral trade, as well in humanitarian projects (people-to-people ties). Recently, he has publicly stated that he will take concrete steps to provide India the status of “the most favoured nation”, in order to strengthen economic ties between Islamabad and New Delhi. In conclusion, we can note the following. As it is known, Russia has always and everywhere opted for the peaceful resolution of any conflicts, as far as it is possible. 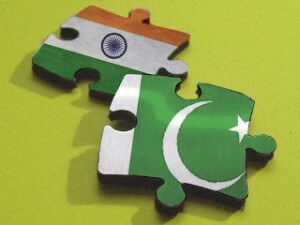 However, it seems that recently, we have weakened this peacemaking process for a variety of reasons, although, we keep talking to our Pakistani and Indian counterparts about the inevitability of an amicable solution of disputes. This has also been proven by the recent mutual visits of the leaders of the three countries. In this context, a reasonable question appears: Why don’t we go back to the good practice, pursued by Moscow, which implied the organization of Indian-Pakistan talks in our country (Tashkent 1966 – Pakistani President Ayub Khan and Indian Prime Minister L.B. Shastri with the participation of the Chairman of the Council of Ministers of the USSR, A. Kosygin)? At that time, we managed to avert a military confrontation between these states. Maybe now it will be something like “Yekaterinburg-1”. Especially as this city is the right place, considering that it is situated on the border of Asia and Europe.